1. Goldenberg: Three of the eight candidates were involved in one way or the other in the scam. Obviously Musalia Mudavadi inherited it when he became the Finance minister in 1993. He did well to stop the Parliamentary Accounts Committee's recommendation that Kamlesh Pattni’ s Goldenberg be paid even more compensation. Paul Muite admitted that “some people” around him were probably in the mix. We should not nail someone merely through guilt by association, but it seems that this matter will for sometime hover over him like a dark cloud. 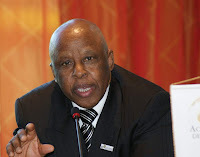 Raila Odinga differed with his then party boss, the late Wamalwa Kijana, the then PAC chair by virtue of FORD-Kenya being the largest opposition party, over this matter, and especially the latter’s pushing of the PAC to recommend the awarding of further compensation to Goldenberg. Actually, Raila instituted a private prosecution that was predictably snuffed out by AG Amos Wako. During the debate Raila could have done himself real good by at least pointing to that private prosecution. One cannot understand why he just kept mum. Had the late Saitoti been a candidate, the matter would have been really politically embarrassing despite his having been exonerated by the High Court. 2. Molasses Plant: In cricket parlance, Raila hit the ball out of the park on this one. He did not do himself any harm by pointing out that Spectre bought the land and the caboodle through a public auction. The impression out there has been that the plant was “grabbed”. Could it have been possible without some dalliance with Daniel Arap Moi? May be or maybe not. Was the purchase illegal? It does not seem to be illegal. Was the purchase immoral? That may depend on where you stand. But the matter as it came out in the debate was not as bad as it has often been made out to be. Of equal significance was the statement that there are “clear registers and records” of those others who contributed monies and were conjoined in the Spectre bid, and that they are represented on the board of the company. The impression out there has been that the Odinga family “conned” those others. 3. The land question: It was being hypothesised that Uhuru’ s threat not to turn up for the second debate was because he supposedly feared that he would end up on the wrong side of this matter or at least it would be as uncomfortable to him as the ICC matter had been in the first debate. He helped himself a bit with the otherwise uncomfortable ICC issue by calling it a “personnel challenge” he has to deal with just like other Kenyans also have to, thus humanising himself even if he was not convincing in regard to how he would govern the country. Uhuru did himself a lot of good to appear for the second debate for he would have had coward written all over himself. His opponents would have had a field day with the land mater, and he would not have been in a position to be able to directly rebut any brickbats that came his way. Perhaps his threat not to attend was just some ploy of sorts. Did his appearance at the debate help his image? It at least created the impression that he was not evading the limelight in some discomfiture. Uhuru in the end did not come out badly but neither was the matter “resolved” if you want to put it that way. Will it now recede into the background? Probably not. He tried his best to explain his position through the “willing buyer, willing seller” line and that it has been dealt with via the declaration of wealth required of public officers. This is much like Mitt Romney declining to make public his annual tax returns save for two years. Uhuru did not dispel the impression that he and his family sit on immensely huge tracts of land acquired by proximity to power, specifically by his father having been the Head of State for 15 years. Is that illegal? May be not. Is it an issue politically and morally? Politically yes. Morally it may depend on where you are, but that it is potent politically is indicated by reports that the Kenyatta family has ceded 4,000 acres in Taveta. And that is precisely the matter. If you can cede that much land, then how much do you own? How did you come to own 4,000 acres in Taveta? Who were the immediate previous owners? If these owners were departing colonial settlers should the land not have gone to Tavetans? How were other tracts of land acquired? This is the line of questioning that Martha Karua should have taken. As a very strong presidential contender, why was Uhuru largely quite about the delay in the appointment of the land commission? Paul Muite did himself a lot of good by proposing that some leases of large tracts of land in the Rift Valley should not be renewed on the expiry of the 99 year period so that the pieces can be used to settle the landless in those areas. Uhuru and Raila did not do themselves much good when it came out that feuds between the Finance and Lands ministries which are probably at the centre of some of the shortcomings in the resettlement of IDPs. Dida touched on a raw nerve in Central Province, i.e the land that those perceived to have been members of or supporters of the Mau Mau lost to the so-called “home guards” and “loyalists”. The latter classes were no doubt quite close to Mzee Jomo Kenyatta. Raila was right, the betrayal of the aspirations of freedom fighters and other concomitant historical injustices cannot be blamed on Uhuru. The commission of the “original sin”, if at all, lies elsewhere. 4. Wages, salaries, inequalities: Paul Muite did himself very well arguing that the way to redress inequalities and low wages is to work to grow the economy, create more opportunities and jobs, and also to grow wages. Peter Kenneth, who put in a very improved performance compared to the first round, did well with apt statistics indicating that he had some knowledge of the basics of this issue. Raila looked at sea arguing that the best way forward in addressing low wages was to “dialogue”, and he staggered a bit when asked if he knew the kinds of challenges ordinary Kenyans undergo. Uhuru performed with confidence in relation to the economic issues, his stint as Finance minister will obviously be a memorable one and also for the good reasons. Karua’s “liveable” vis-a –vis “minimum” wage was a gem. Dida seems most acquainted with the hardships that ordinary Kenyans have to undergo. Much as the Salaries and Remuneration Commission is a constitutional body that cannot be dictated to, it is not convincing for presidential candidates to be seeming to be leaving everything in regard to the salaries of state and public officers to the commission, especially when its recent proposals on the pay of state officers appear to be signalling business as usual. 5. Compromise candidate: Mudavadi who otherwise had a good debate, having responded strongly to the Goldenberg matter, finished with a whimper because of his closing statement. His candidacy has been premised on “compromise”. What he needs to learn is that Kenyans will never elect someone as president simply because he is some compromise candidate, and especially if they are perceived to have a weak spine or are weak kneed. Kibaki was a compromise candidate in 2002 not because he is “gentle” but because he was also the “strongest” among the people supporting him. Through the NAK he had managed to bring together no less than 12 political parties including his DP, FORD-Kenya, and NPK. The LDP brigade of Raila, Kalonzo, and Awori had no choice but to endorse him since the very act of departing Kanu and actually joining the “opposition” that they had hitherto scoffed at, had in a way weakened them. You do not seek refuge in a neighbour’ s house and think that you can call the shots there. Kibaki had since his loss to Moi, having come in at a strong second remained steadfast as leader of the opposition while Raila had his NDP dissolved to join Kanu. Mudavadi who wants to paint himself as a Kibaki of sorts with a “gentlemanly mien” should pay attention to Kibaki’s bare knuckled campaign in 1997. In the 2013 general election, it is Raila and not Mudavadi who is the compromise candidate, and it is precisely because he is stronger than Mudavadi, with the latter apparently being a very poor student of Kenyan political history despite having been in its midst for over two decades. Coincidentally, Raila is in 2013 a compromise candidate facing Uhuru as his strongest opponent just like KIbaki faced the latter as a compromise candidate in 2002. In contrast to the departure from Kanu by the LDP troop, Mudavadi vacated ODM almost alone. At least William Ruto left with his colleagues from North and Central Rift and beyond in tow. If Ruto and Uhuru were not willing to have the much stronger Kalonzo as their compromise candidate, how were they going to settle for Mudavadi? As the time ticks every second closer to March 4, 2013, I keep asking myself whether my overzealous, over-confident, passionate and over-enthusiastic presidential candidates and their supporters have stopped one day to ask themselves where and how they will manage their over-size egos and impractical expectations respectively, incase of a loss after the forthcoming elections. This subject bothers my conscience because both history and experience has taught us that there is nothing as dangerous as a humiliated god, and as lethal as his or her supporters in moments of a publicly announced loss. We all know that it is not easy to let go of a political dream that has taken years to put together and several months to sell to the electorate, especially for presidential candidates for whom a loss would mean taking their party manifestoes to libraries, shredders and dust bins. Listening to speakers in the last presidential debate, and speeches by most political leaders at campaign rallies, it is interesting that every presidential candidate expects his party to win the forthcoming elections by a landslide. It does not help the situation when latest opinion polls put the two leading coalitions of Cord and Jubilee at par in terms of popularity. The relevant question that sometimes we fear asking is where these leaders get the data to back their anticipated overwhelming victory confidence. Whereas I disagree with Karl Marx in his critique of Hegel’s philosophy of religion when he says that “religion is the opium of the masses” and merely a tool to control people to do good, I am deeply convinced that politics is the hallucinogen of the electorate that causes voters to fear imagined ghosts and embrace speculative nirvana based on political superstitions and hocus pocus. Superstitions as an extension of a people’s culture and belief system are good. But, political superstitions interpreted from events like the fall of a Mugumo tree, the flow of Rivers Chania and Nile, the shape of a political candidate’s head or prophesies from some untidy magicians from Tanga only produce mass mental fanaticism, blind ideological enthusiasm, un-informed party loyalty and moronic elections euphoria that are seldom associated with extreme stubbornness and dangerous pride that refuses to concede defeat even after being fairly beaten at the ballot. Presidential candidates and their supporters must therefore be alive to the fact that as long as voters in rival parties and coalitions are not persuaded to desert their parties to the other side, and as long as there is no sweet scent of an ideological revolution that promises benefits and better lives to those who take part in it, there will be no landslide presidential elections victory in Kenya anytime soon. My reason for this observation is because Kenyan voters especially those belonging to the two leading coalitions have and will always be influenced by the same motives, persuaded by the same propositions and therefore will still continue voting the same way. The large hyper-loyal political following enjoyed by the two leading coalitions’ presidential candidates poses the greatest threat to peace in post-election Kenya. The two leaders, in view of their strong support bases appear to have cultivated egos that look like oversize balloons. When some of these candidates look at Kenyans in the face, all they see is their own reflections and nothing else. They seem to have outgrown the Republic of Kenya in size because of the sycophantic blowing of hot air into their egos by their supporters. The presidential candidates have surrounded themselves with men and women who only tell them what they want to hear. People calling themselves advisors who are persuaded more by tittles, pay-cheques and proximity to imagined power than by facts. The word losing elections is a taboo to their lips and a curse in their minds. Such candidates live in bubbles created by them, and lived as reality. Unfortunately, some of these utopian bubbles and ego balloons have to burst after elections when Kenyans go to the polls. But, are they ready for the burst? My advice to all aspirants in the forthcoming elections especially presidential candidates is to pick up from where they left before the campaigns began. They should peacefully and honorably go back to their offices if they will still be having any. They should buy airtime and make phone calls to those who won and those who lost. They must psychologically prepare themselves for those who will meet them on the streets several weeks, months and even years later and comment: “That is the K’Okoth who lost in last elections”.It is becoming clear by the passing of every day that either Raila is going to Bondo to grow cotton at his Apoda farm, or Uhuru is going back to Gatundu to attend to his coffee bushes. And, it is life and life must continue without ill-feelings or prejudice. They can always rise up, dust themselves, look up, produce posters and fight another day. ATTORNEY GENERAL Githu Muigai has announced that the senior most judge in the Supreme Court may swear in the president-elect in the event Chief Justice Willy Mutunga is unavailable. Yesterday Githu sought to allay fears of a constitutional crisis in the swearing in of the president-elect in the unlikely event that Mutunga is unavailable following the sacking of deputy chief justice Nancy Baraza. Though Judicial Service Commission last week appointed Court of Appeal judge Kalpana Rawal to replace Baraza, her appointment awaits vetting by MPs and eventual approval by parliament to enable Rawal discharge her duties. Nonetheless, Muigai said consultation within the government had led to an agreement that the name of the supreme Court Judge be gazetted as a possible stand-by to conduct the swearing in ceremony. Githu was speaking during a press conference following a meeting with constitutional commissions and independent offices holders on election preparedness. Chairman of the forum Otiende Amollo said they are satisfied with the general preparedness of the elections and promised to support the IEBC deliver on its mandate. The hectic campaign schedules by the top candidates in the general election are taking their toll on presidential candidates and their entourage. Last weekend, Jubilee Coalition running mate William Ruto landed in Murang'a for a rally after a series of whistle-stop campaigns the same day. The pace and speed of the meetings were probably too many and too confusing because when he landed, he could not seem to remember exactly where he was in the hectic itinerary. They landed in an open field to be meet by a large crowds emblazoned in distinct red with white TNA colors.Turning to former local MP Jamleck Kamau, Ruto whispered:"By the way, can you tell me where we are?" 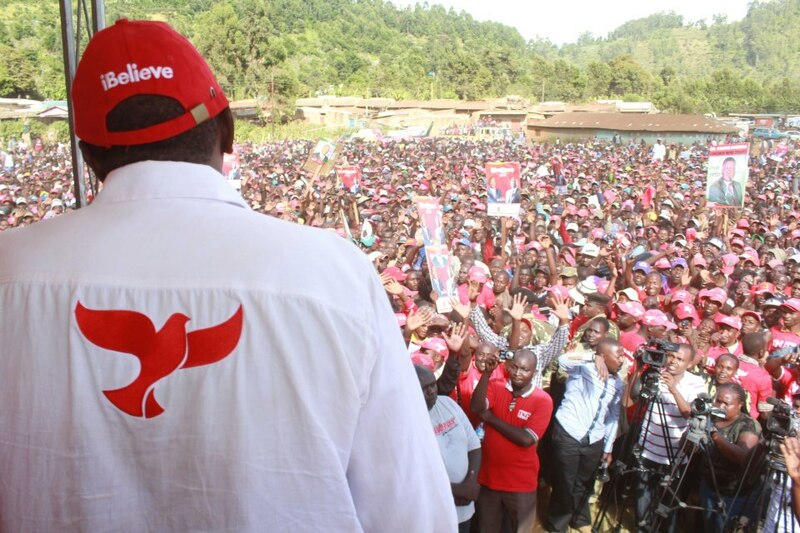 A key ally of Jubilee presidential candidate Uhuru Kenyatta and a close associate of civil service boss 'turned' Kakamega town red festooning the streets and buildings will TNA colors, flags, billboards and roadshows. The hype and hoopla caught up with former civic leaders including those from other non-Jubilee coalition parties such as UDF and ODM, who could not resist the excitement and waved the flag in support of Uhuru. A civil society activist in a tongue-in-cheek remark after the second and final presidential debate on Monday said it was a blessing in disguise that the original custodians of the Bible were not Kenyan MPs. The man wryly noted that given the propensity of Kenyan MPs to mutilate and bend laws to suit their own selfish ends, it would not have taken them long to have changed the Bible thereby denying believers of the much promised redemption! As the campaigns spectacularly draw to a close, some of the businesses that have been operating 24 hours a day, seven days a week for the last few months are slowly closing down for a much needed rest. One would think it is only those businesses producing campaign posters, t-shirts and other campaign paraphernalia. However, we are told that a pub in Embakasi village which was the nerve centre of one of the candidate's campaigns has closed shop after the man withdrew his patronage. It seems the candidate and his huge number of 'supporters' and other hangers-on were the main customers and when he left to go on the campaign trail, the 'customers' also disappeared making it difficult for the pub-owner to retain the huge workforce that he had employed to serve. The other 'regular' customers are just too few and far between to sustain the business. 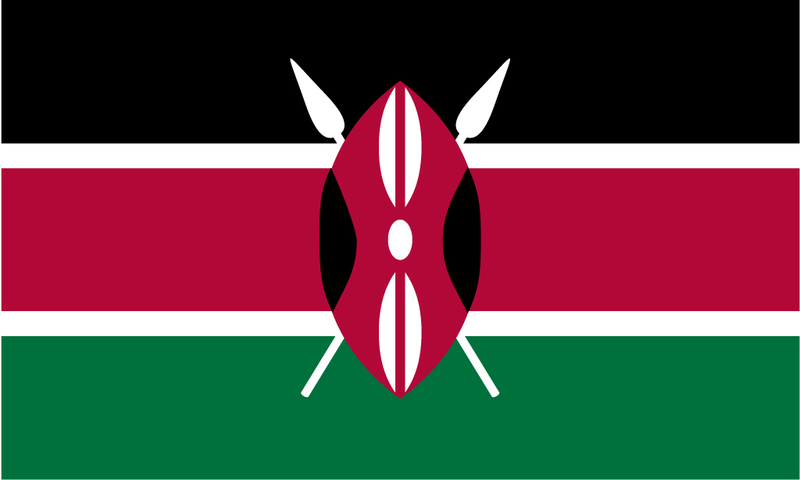 Thursday, the 28th of February 2013 -With just three days left before the country goes to the polls, the Independent Electoral and Boundaries Commission (IEBC) today received a welcome shot in the arm after Commonwealth Observer Group expressed confidence that it has the competence to deliver a free and fair election. “We have met with IEBC Chairman and he assures us they are ready for the tasks that lie ahead and will closely follow all aspects of the process,” he said. “Of particular note is the need for the IEBC to ensure the timely opening of the polls, the effective management of the more complex voting process and the efficient and transparent management of the results process,” he advised. The statesman also lauded the Presidential candidates for taking steps to reconcile with each and with the people since it serves to cool down political temperatures. He further urged the politicians to obey the election code so as to set an example for their followers. “It is to Kenya’s credit that in subsequent years some of this confidence has been re-gained, notably with regard to the judiciary and management of the electoral process. These elections are the next step and it is imperative that first and foremost political contestants engage in all phases of the process in a responsible manner,” he said. Thursday February 28, 2013 - Jubilee Presidential hopeful Uhuru Kenyatta has promised to free 14 suspects facing charges of trying to disrupt Prime Minister Raila Odinga’s rally in Embu. Speaking in Embu town on Wednesday, Uhuru said the accused were suffering “for no good reason yet they had not been proven guilty. “The young men should not worry. I have made arrangements with the Governor and the Senator for them to be released today,” Uhuru told a mammoth crowd that had turned up for the rally. The 14 were arrested for disrupting a CORD rally at Embu Stadium presided over by the coalition’s flag-bearer Raila Odinga and his running mate Kalonzo Musyoka. They were accused of heckling speakers and pelting listeners with stones on February 15 rally. The suspects had initially been released by Senior Magistrate Paul Biwott on a Sh 250,000 bond and a surety of similar amount or Sh 100,000 bail each. The suspects were unable to pay and applied for a reduction. Biwott reduced it Sh 100,000 bond and a surety of similar amount or Sh 50,000 bail each. Uhuru said he will help them settle the bond so that they can vote on March 4th. RAILA/ KALONZO criss-cross RIFT VALLEY and WESTERN while warning on a UHURU/ RUTO Govt. 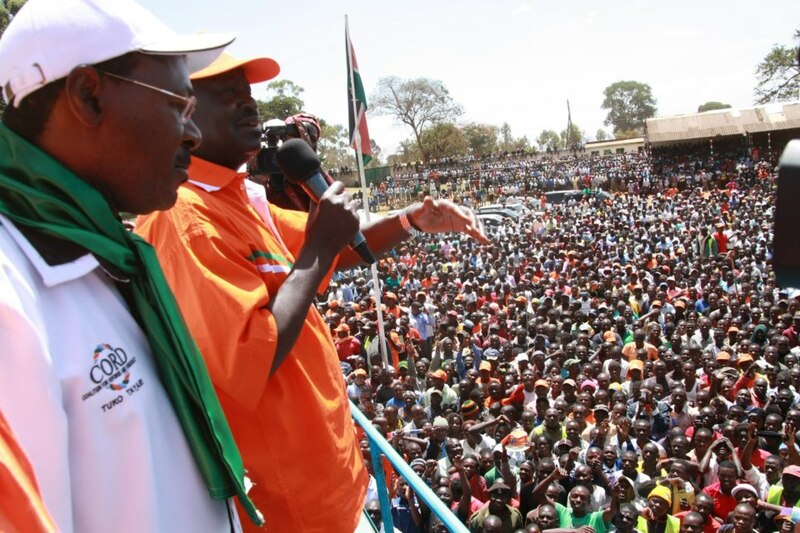 Thursday, the 28th of February 2013 -The two main principals in the Coalition for Reforms and Democracy (CORD) have repeated their call for the alliance’s supporters to show up in large numbers on March 4th so that they can clinch victory in the first round. CORD flag bearer PM Raila Odinga and his running mate Kalonzo Musyoka made the appeal at different campaign stops in the Rift Valley and in Western Kenyan today. The two leaders addressed their supporters in Kitale, Bungoma town, Malaba border and Busia stadium as they intensified their campaigns with just three days to the elections. "Come next Monday, I call upon each one of you to turn up in large numbers, vote as a block in favour of CORD and I know we shall win in the first round and as from March 5 we are going to start marching towards true change and transformation of this country,” said the PM. "Be wary of conmen who are peddling propaganda and empty rhetoric that would not benefit any Kenyan. They have nothing new to offer you, therefore, you must reject them,” he said. "The secret of winning in the first round is for you voters to turn out in large numbers and vote, we will implement the new Constitution to the letter and liberate this country,” said the VP. Musyoka added that a run-off would set the country back about Ksh 6 billion and that money would be better spent on development. Uhuru Kenyatta sees ICC case "collapsing"